This just in, from Nikki Finke’s Deadline Hollywood Daily. Check the site often for up to the minute updates. 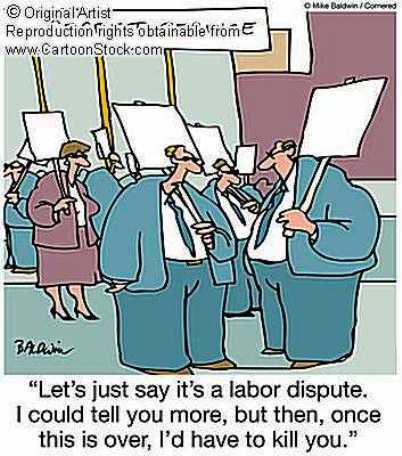 Writers going on strike may not sound like much, but under the surface, such an occurrence can affect everything from late-night talk show jokes to your favorite sitcom. This is big, people! And it may get ugly. During her journalism career, Nikki Finke has been a foreign correspondent in London and Moscow for the Associated Press, a correspondent for Newsweek in Los Angeles and Washington D.C., as well as a Los Angeles Times staff writer. Since 2002 Nikki has been a columnist for LA Weekly, writing about the culture, politics, and overall business of the industry in her “Deadline Hollywood” column. Nikki Finke began DeadlineHollywoodDaily.com in March 2006.
next post: Larry King Doesn’t Know Who Jerry Seinfeld Is. 48 queries in 0.759 seconds.